In 1837 King Willem I was presented with two African princes, Kwame and Kwasi, as security in a deal concluded by the Dutch government. Arthur Japin’s novel, The two hearts of Kwasi Boachi, has made the story of these two African boys nationally and internationally famous. 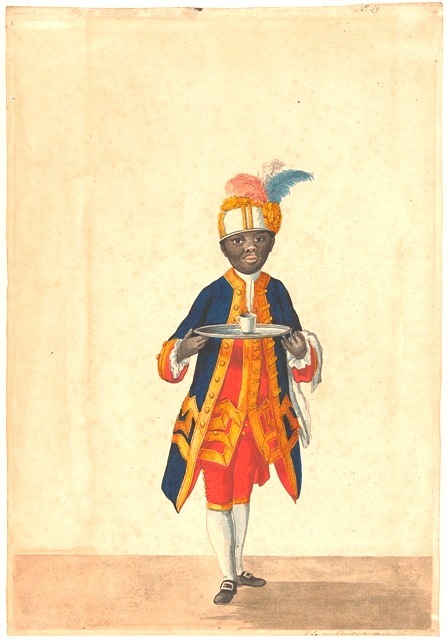 The entrusting of African children to the care of a European ruler was not uncommon prior to 1800. Black people, often children, had been given as gifts to northern European rulers by their southern European counterparts from the first half of the fourteenth century. In 1354, for example, King Jean le Bon of France (1319-1364)had been presented by the prince of Aragon with a black man named ‘Jean le Blanc’. A few years later his son, Jean Duc du Berry (1340-1416), received a similar gift.Little is known about the life of these ‘presents’. More is known about the life and identity of the two black boys/men who appear in various paintings beside Stadholder Willem V (1748-1806) or his wife Wilhelmina of Prussia (1751-1820). They are Cupido and Sideron (Citron), whom the Dutch West India Company (Dutch abbreviation WIC) probably gave to the stadholder in the 1760s, when he was still in his teens. 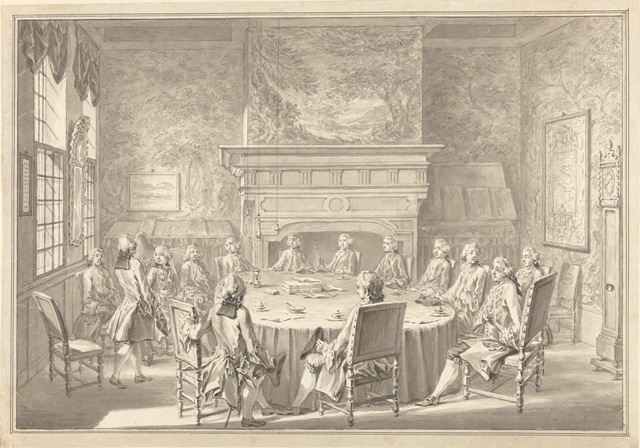 Willem was sworn in as a member of the board of the company in 1768, and was destined to become governor-in-chief of both the Dutch West India and East India Companies (Dutch abbreviation VOC). 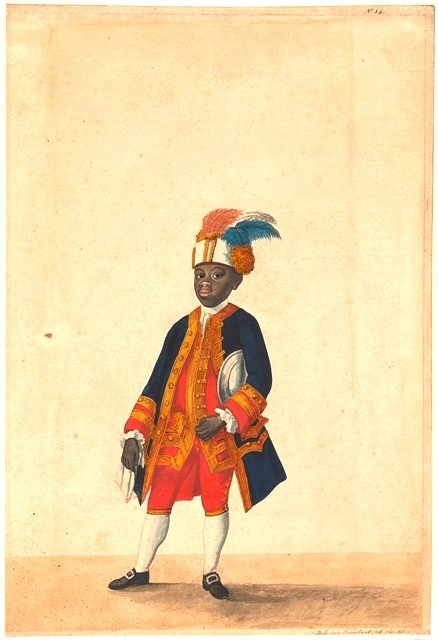 Documents reveal that Sideron was born on Curaçao and came to court in 1763, at the age of seven. Cupido is first mentioned in 1766, although there is a picture of him from 1765. The two young ‘Moortjes’ (little Moors), as they are known in documents from the Koninklijke Archieven [Royal House Archive], received several years’ training. In 1770 Isaac Lodewijk la Fargue van Nieuwland (1726-1805) painted watercolours of the two in their serving livery. The two are still children in these works. They slept above the stables, received instruction in skills such as dancing and were supposed to entertain Willem V, together with his pages. For this they were paid 156 guilders a year. 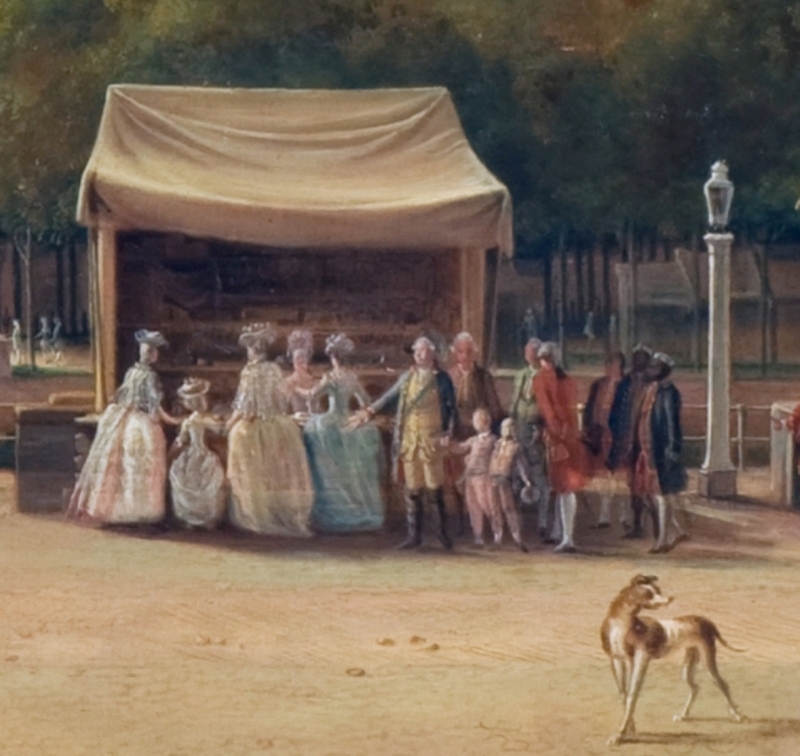 Around 1782 Cupido and Sideron were both promoted to the position of valet. It seems likely that they were constantly in Willem retinue. Their presence is certainly recorded in two paintings. In 1765 Albertus Frese de Jonge (dates unknown) painted the two little boys in the interior of the Grote Kerk in The Hague. Although Willem V does not appear in the picture, the boys’ presence has given rise to the title A visit by Willem V to the Grote Kerk of The Hague. 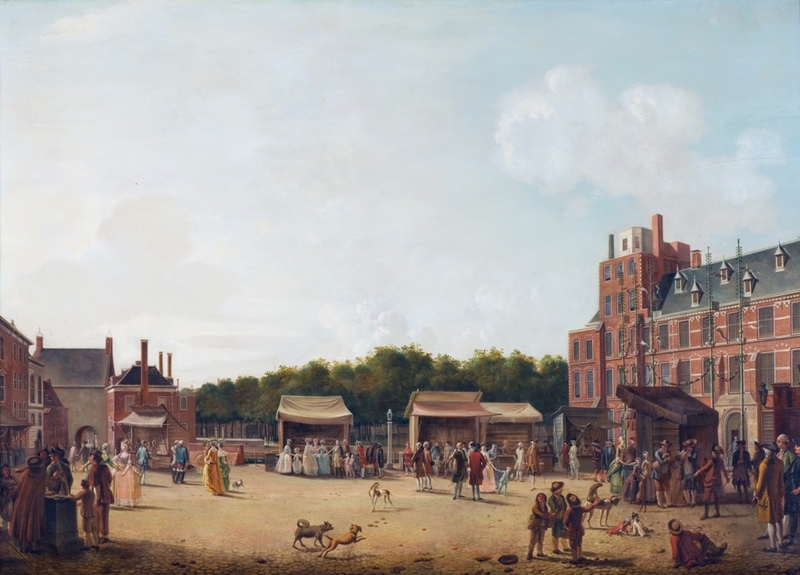 In 1781 Hendrik Pothoven (1725-1781) painted The Buitenhof during the Hague Fair looking towards the Gevangenpoort , (above detail). Standing at one of the booths is Willem V with two black men in his retinue, for by this time the little boys had become adults. In approximately the same period Pothoven drew two splendid full-length studies of black attendants, who are more than likely to be Cupido and/or Sideron. 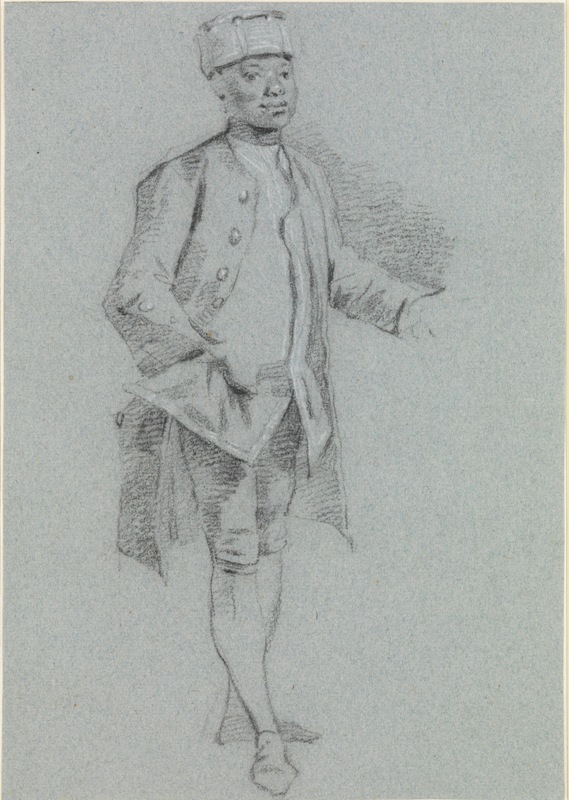 Pothoven may have produced this figure or costume study during his time in the court capital. The young man is probably one of the two black valets, Cupido and Sideron, who worked for Stadholder Willem V (1748-1806). Pothoven also included the two in his painting The Buitenhof in The Hague at fair time, looking towards the Prisongate (1781, Haags Historisch Museum), in which they can be seen in the retinue of Willem V. They wear similar clothing in this picture to the boy in this drawing. Moreover, Charles Dumas contends that the livery in the drawing is typical for the court of Willem V around this period. In 1795, when Willem V was forced to flee to Great-Brittan by the French Revolution, he took his two black valets with him. Apparently he trusted them completely. Cupido departed for Oranienstein, Willem’s castle and estate near Dietz in Germany. Sideron remained with Willem an Wilhelmina in England until approximately 1802 when they all moved to the German estate. A follow-up study started, were new information has come afloat. Some data in this new study, which will be published in 2017, deviate from the above data from 2003/2008. There is increasing insight . Dutch: <De Oranjes en zwart verbeeld> See for more recent research other pages and posts on this webisite.